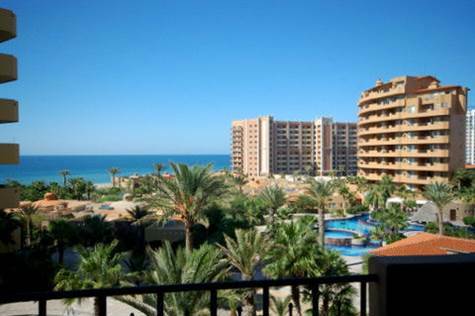 Bella Sirena, Sandy Beach - Bella Sirena B302 offers beautiful ocean views from a secluded balcony. Richly furnished with accents of red B302 is a one of a kind turnkey property. This exceptional condo has recessed lighting throughout, boveda ceiling in the great room area, granite counter tops, Sony speakers inside and out AND it’s completely furnished! Looks like new! The master suite with private balcony area has a huge bath with double sinks, oversized bath tub and walk in closet. The quality wall unit offers desk space and cabinets for added storage while still adding to the ambiance of the bedroom. Flat screen TV can be mounted on the wall. Fun kitchen décor and colorful dishes add to the energy of this exceptional condo. You’ll have a great feeling from the minute you walk through the door. The great room floor plan is open and extremely functional for entertainment. Guest bedroom looks out to the sea; has a flat screen TV, 2 closets and private entrance to the balcony. 2nd bathroom has a beach motif, large shower and is located right next to the guest bedroom. Dining room table will seat 8 easily and could even do 10! It’s perfect for family and friends! The laundry room is off the kitchen and has lots of room for storage and a large walk in pantry for the gourmet chef. Bella Sirena B302 is close to one of Bella Sirena’s pools and Jacuzzi. This area also has grills for your favorite outdoor dinners. Please call for an appointment and see what we mean when we say “all you need is your toothbrush”! Posted: Monday, March 25, 2013 12:48 PM by Grant MacKenzie Sr.